Pretty Cute UGLY Party, right? 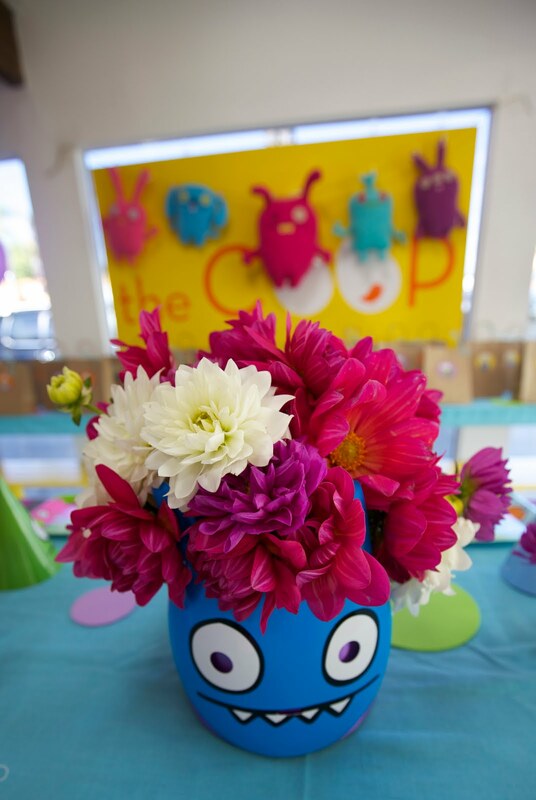 My youngest son LOVES Ugly Dolls -- luckily for sweet Sadie who wanted an UGLY DOLL theme party. Because of Grants love for the ugly -- I happen to have at my disposal quite a few actual Ugly Dolls that I was able to use for decor on this one! The only caveat (my poor children have had treasured treasure chests and many other of their toys ruined by the COOP and it's parties!!) was I had to be sure nobody thought HIS dolls were up for grabs... That's how I decided to make the Ugly Doll banner out of actual stuffed dolls! Isn't it darling? I think it tuned out great -- and really made the party look special! I really just wanted to go for fun and colorful for this party -- and I just LOVE how it turned out. I used my new favorite turquoise table runners -- and then cut colored foam pieces in different sized circles to add some more color to the tables. 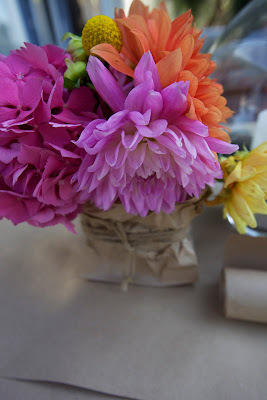 The real punch of color came from the flowers -- dahlias in many different shades. Love how they turned out (put an Ugly Doll mask around the main arrangement to really "theme" it up!) 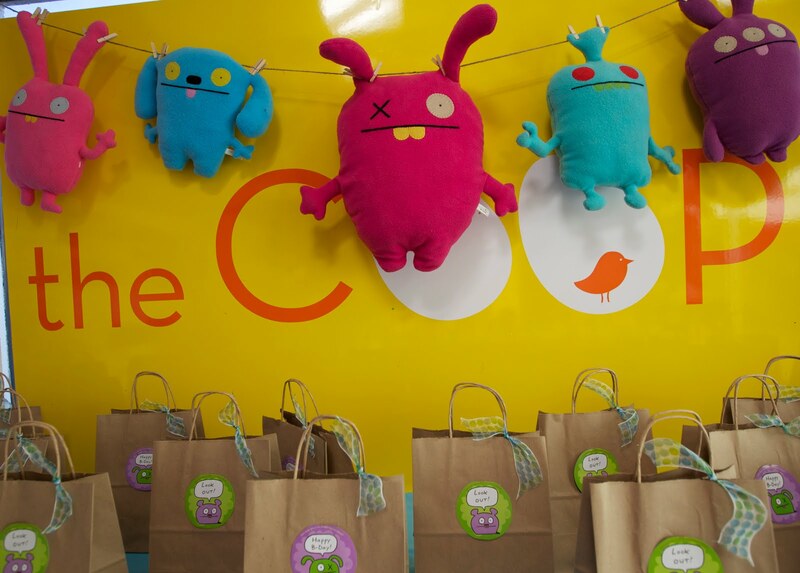 The kids all go an Ugly Doll backpack clip, a bunch of Ugly Doll goodies and a fun light up ring -- just in time for safe Halloween-ing! 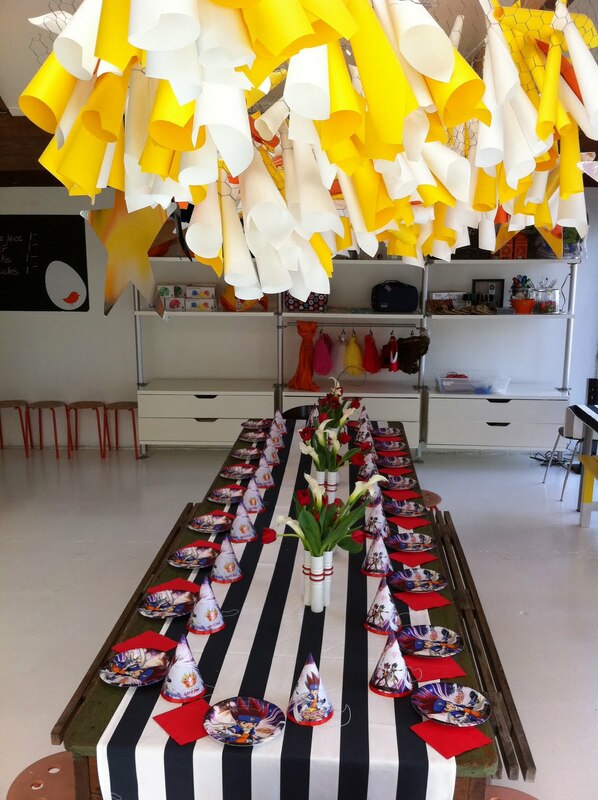 I just love a room full of color -- and this party room certainly did not disappoint! Nothing ugly about it!! 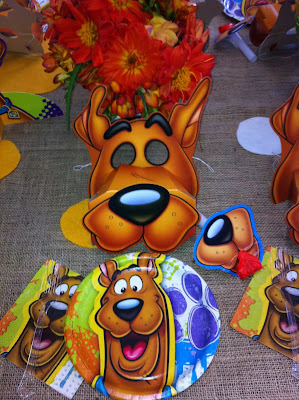 Scooby Dooby Doo... where are you? 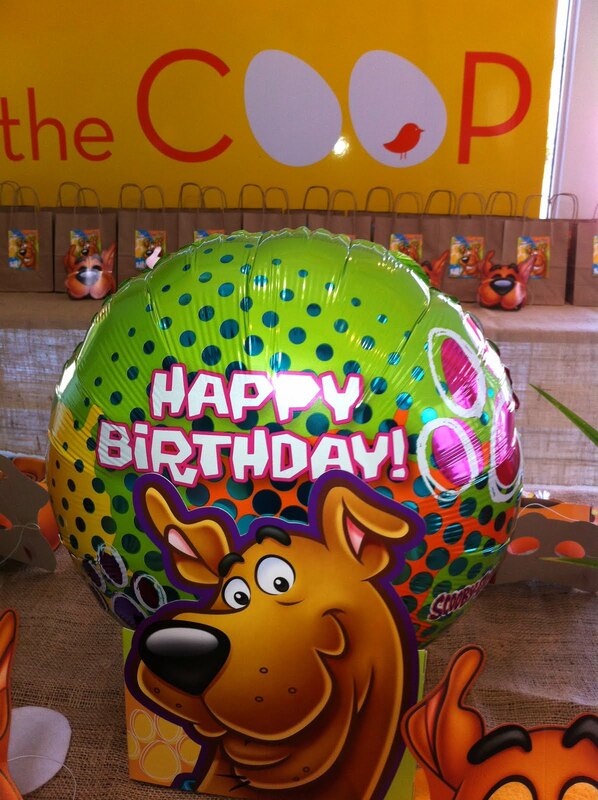 At the COOP of course! 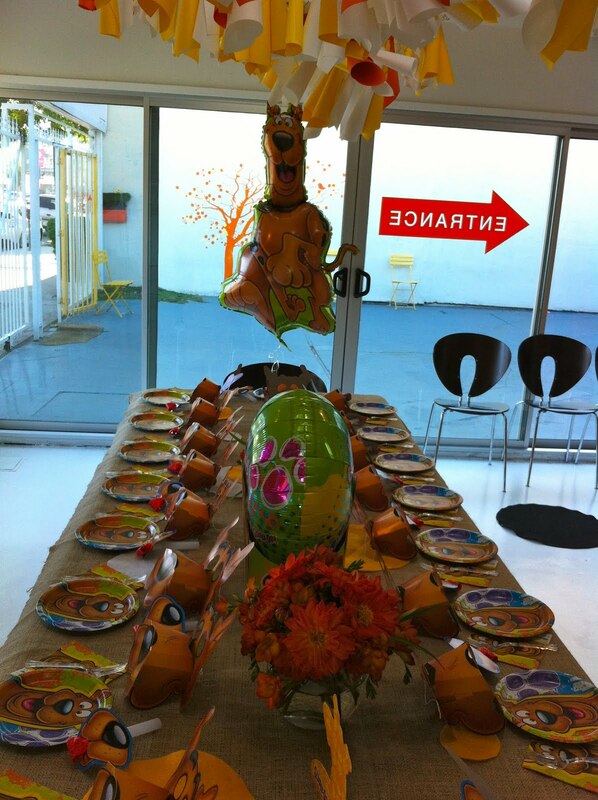 We had a great Scooby Doo party for two brothers (they of the "Cute Critter" party last year!!) this past weekend. It turned out so great. It was like a 70's flashback with all the orange, green and brown -- I LOVED it! Felt like it was a Saturday morning looooong ago. Funny aside.... Ana who works with us -- and is now on the TV show "Secret Life of the American Teenager" -- well, she happened to be working this morning -- and texted a pic of her in her Scooby mask to the actress who plays her mom on her TV show --- MINY COHEN!!!! Mindy Cohen -- aka the voice of Velma! Isn't that funny? Anyway -- back to the party. I wanted to keep it cool and pretty simple... orange flowers on burlap runners -- with all the Scooby Masks (which were soooo cute on the kids) on the main table. WE kept everything gift-wise bagged up from the beginning as it was a pretty large party. Sorry -- there are no pics -- but each kid got a really cute dog nose, dog ear headbands and then some cute branded Scooby goodies. It was a really cute gift -- for a couple of really rad brothers -- who just happen to LOVE Scooby Doo! Ohhh - I started off this party in SUCH a great mood. 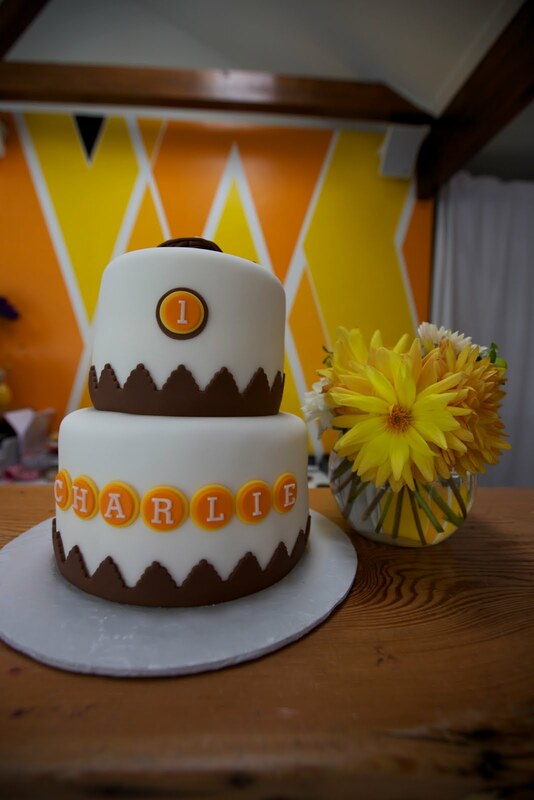 I was already thrilled with how it looked -- but I was BEAMING when the birthday boy showed up and before he even stepped in the door he started making monkey noises and scratching under his arms when he saw the set up. It was officially my best ever stamp of approval! Just darling. 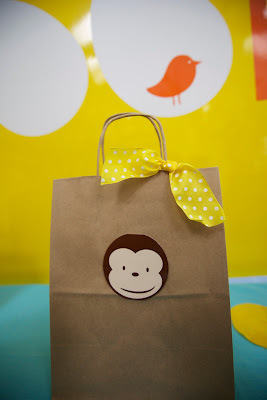 Mom wanted a straight up monkey NOT Curious george theme. 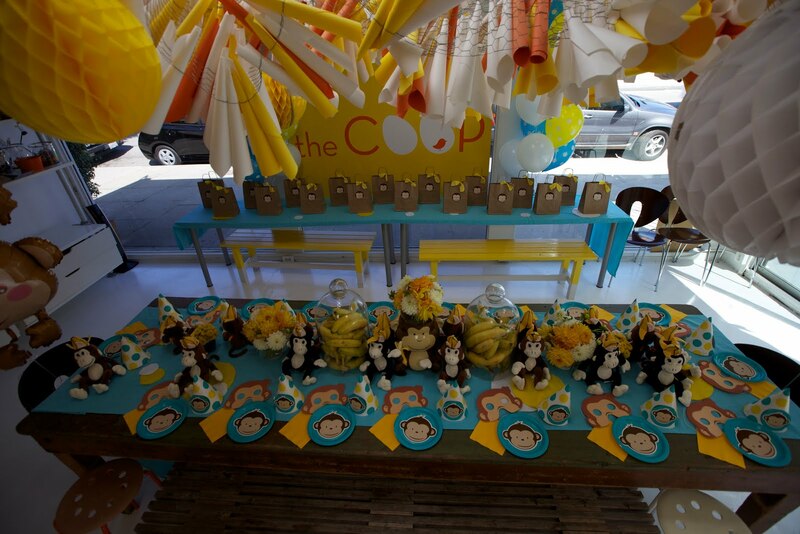 I found these cute little mod monkey plates, napkins, blowers and hats which set the color scheme and the mood for the whole party design. 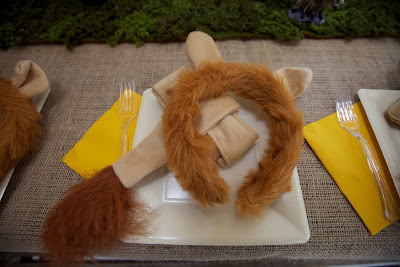 I used our great turquoise table runners -- which matched the monkey plates perfectly! I used the monkey centerpiece we use for jungle parties (can you believe that darling little guy is a kids trash can! so cute.) 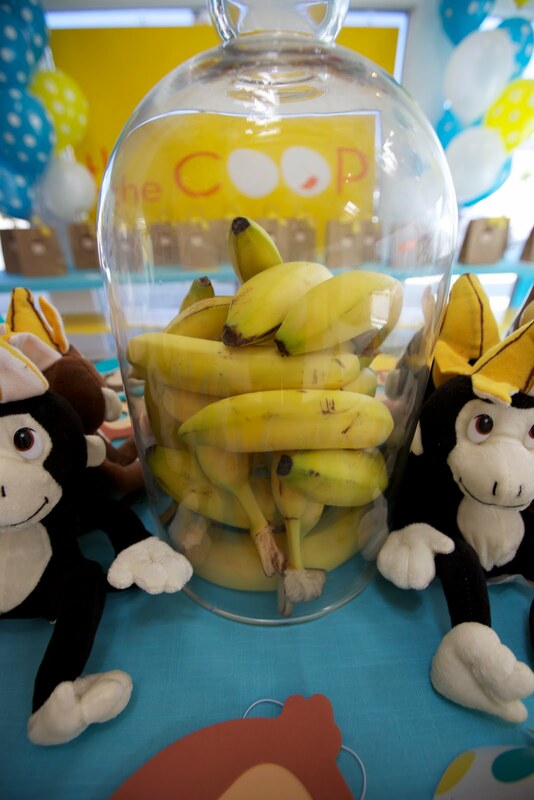 and - my favorite part... our glass cloches filled to the rim with bananas. It's such a great way to add a theme-ie POP... and it looks so chic (and it's not pricey!). The best part was the kids were all asking for bananas at cake time!!!! Amazing. The goodie bags all had -- a banana, a stuffed monkey, a monkey mask and a "barrel full of monkeys" game. 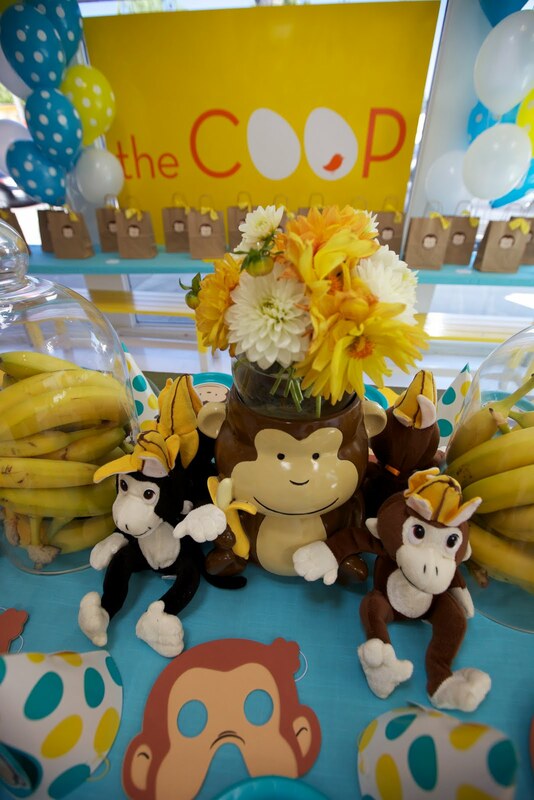 Lots of happy little monkeys swinging out of the COOP at the end of this party! This party started off the BEST way possible.... mom waltzed in and the first thing out of her mouth was "Oh MY -- you really outdid yourself Juliet!" So sweet. And I kind of agree. 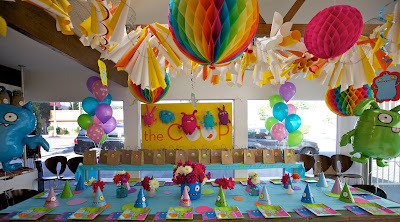 I just love how this party looked. 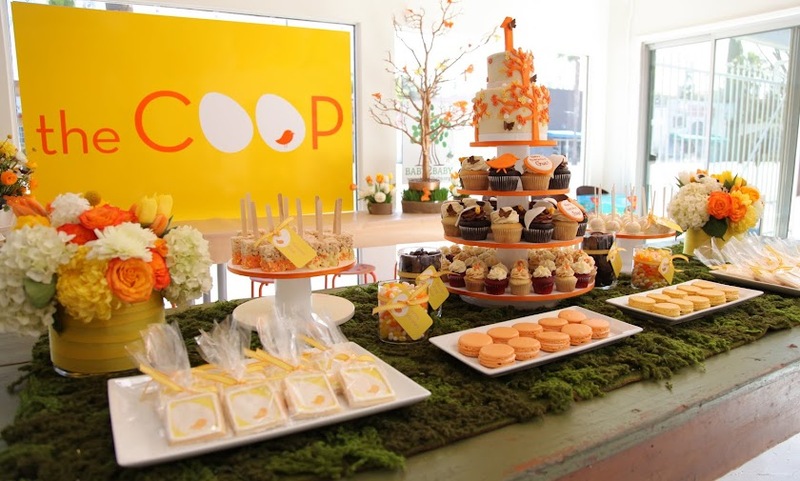 Any party that is in the orange , yellow and white scheme is always fab -- probably why I love the COOP Classic party so much! 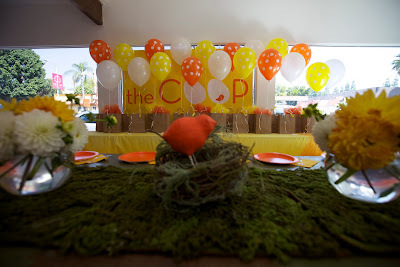 This was a COOP Classic THEME party though -- so the fabulous quotient was even higher than usual! I love love love the new nests I got for the table ... and those darling paper mache birds! How gorgeous are they? I painted them in our colors to make them super COOP-ie... but they already were pretty COOP-ie.... Look how much they look like the bird in our logo! They are just perfect. 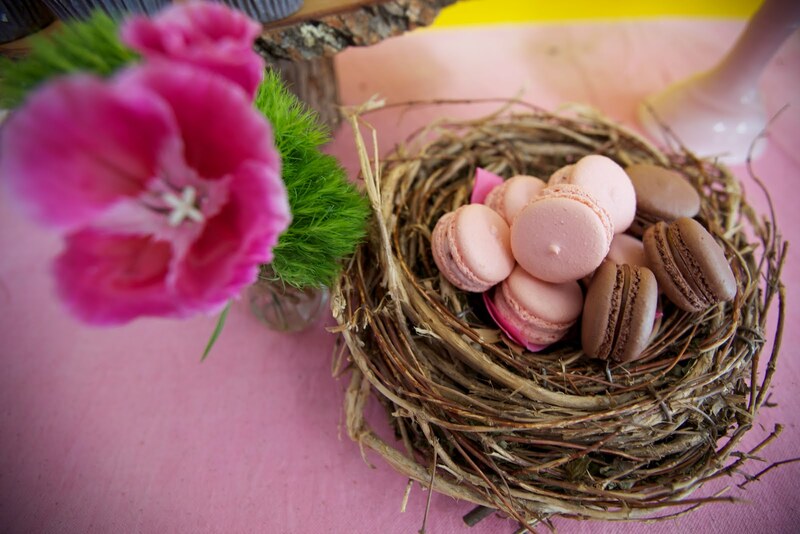 The nests were sitting atop our favorite moss runners -- and I did yellow and white flowers too! The girls all got tutus and boas (very bird like!) and the boys got yellow capes and gold masks. All the kids got a chineese take out box filled with a little green paper shred (grass) a musical shakie egg and a wind up hopping chick. 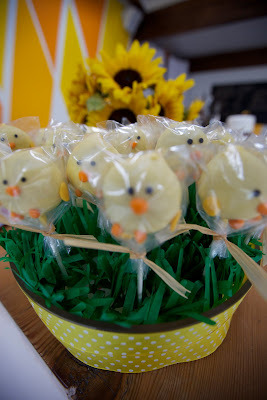 Oh -- and how lucky was mom that I have so many supplies laying around.... she walked in with those darling cake pops -- but no way to display them. I quickly made this low ribbon wrapped vase filled with paper grass. The caterer was actually quite impressed by that one! It was a great party -- with a great crowd... and a very very happy birthday COOP chickadee! 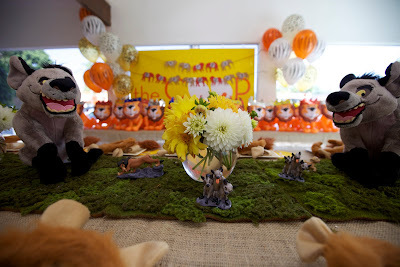 We had a wonderful little guy who had a LION KING party this weekend.... emphasis on the Hyaenas! He LOVES the scary hyaenas. More power to him, I say --- but it did make for a bit of a task when it came to designing the party. 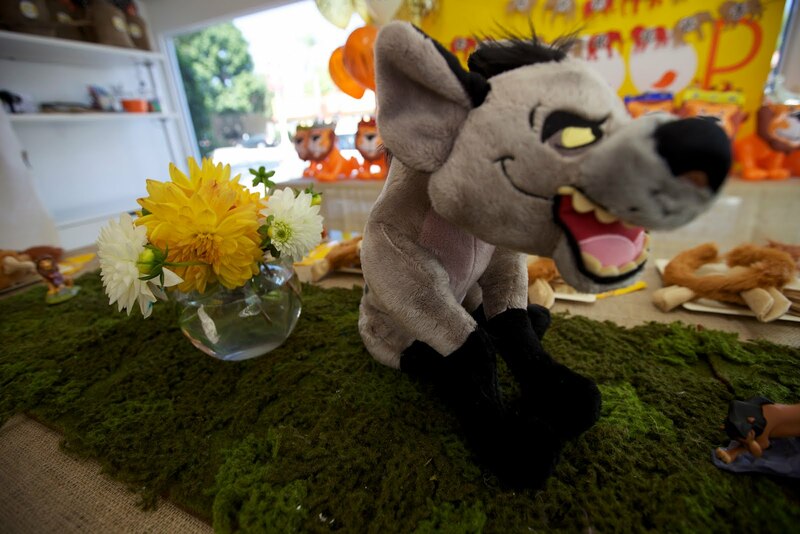 You see -- I think Disney AVOIDS the scary characters when doing their party supplies!!! So we had to improvise. I think we did a pretty great job actually. Lucinda ordered those funny little inflatable lions, that we topped off with crowns (they are KINGS after all!) as well as the great looking stuffed Hyaenas that we placed center stage on the table. I went with burlap table covers -- and our mossy grass runners which we placed lots of small figurines on (they went in the goody bags as well). At each setting was a lion tail and ears which are just adorable (Lucy's doing again!)... 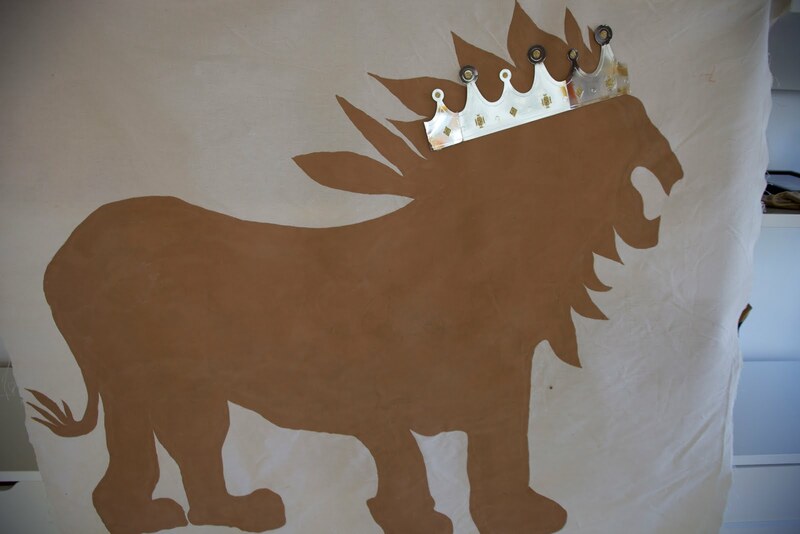 and the front room was capped off with my fabulous Lion painting (that I did for a safari party).... which we placed a crown on as well. So cute. 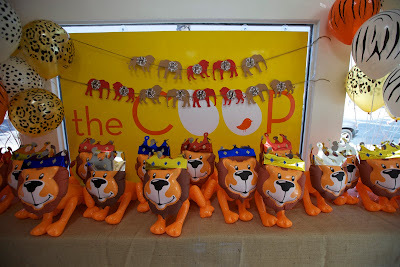 I also convinced my local Subway manager to sell me ALL of his Hyaena Subway reusable lunch bags that we used as the goody bags -- to really seal the deal that this was a Hyaena party -- not JUST a lion King party! The mom really couldn't believe the lengths we went to to give her little guy exactly what he wanted for his party. She was ALMOST as happy as the birthday boy himself! Oh my! 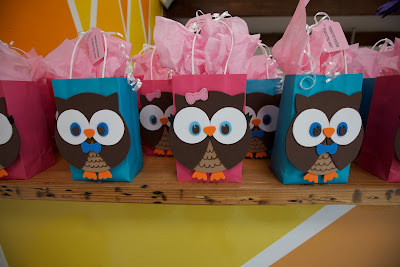 I was so excited when this mom came in and wanted to do an owl party... 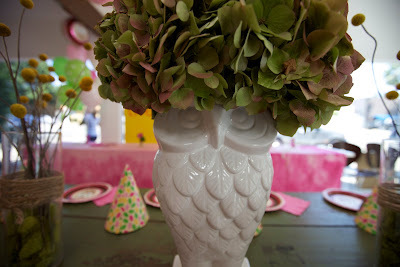 I have the MOST FAB Owl vase at home that I have been dying to use at the COOP -- and here was my opportunity! 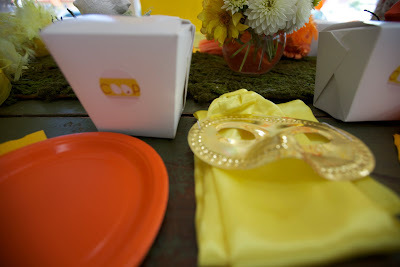 Mom actually bought the gifts and the plates on her own for this one (how cute are the goody bags? She got them on etsy. Adorable!). 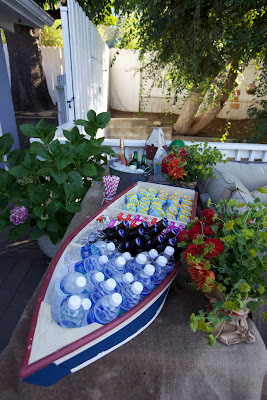 She just asked me to help with the decor elements and flowers. I think it ended up looking SPECTACULAR! The Owl vase was so perfect! I loved how the hydrangeas made him look like he had an afro! So Darling! 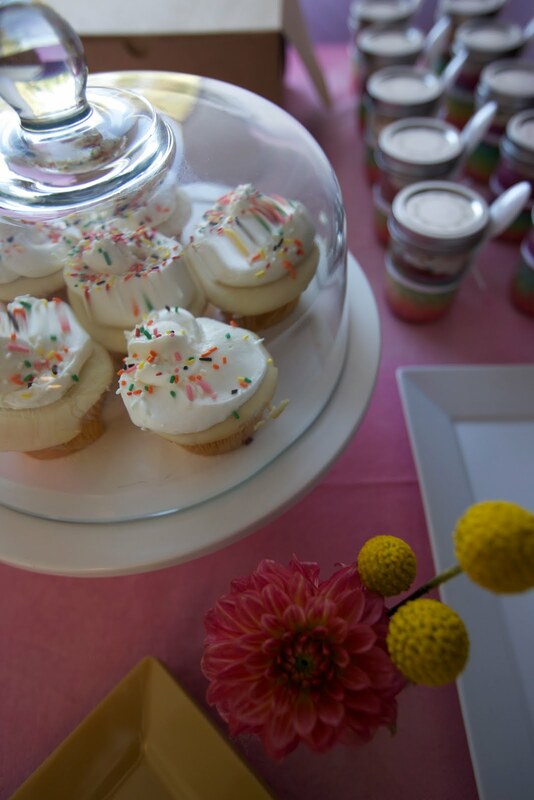 I also did lots of smaller arrangements -- billy balls, and lots of pink and green flowers to match her party goods. 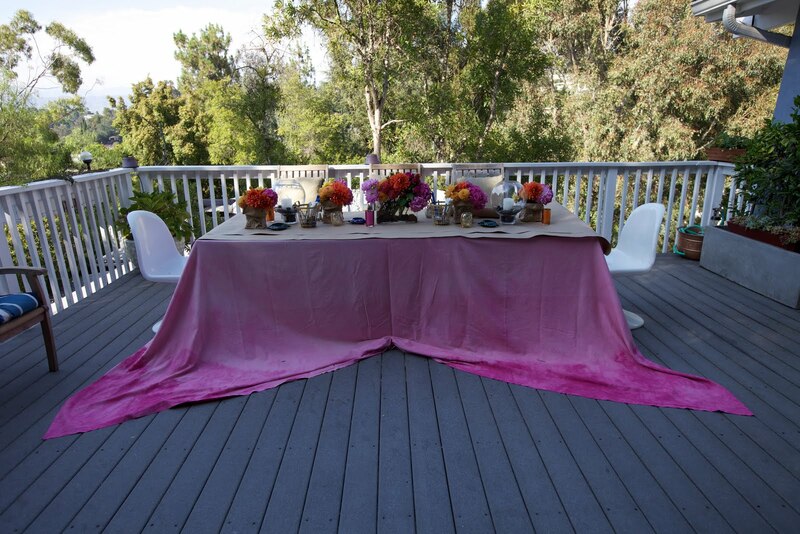 The table cloths outside and on the back table-- how freaking fantastic are those things!! I hand dip dyed those ombre pink masterpieces for a party at my house -- and thought they would be great for this party. They were! 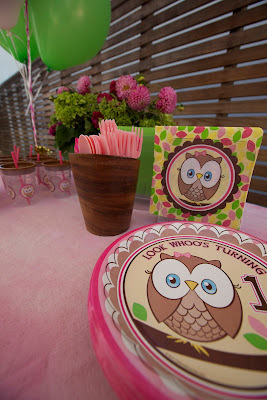 Julie also did a spectacular (as usual) Owl treat table with wood pedestals and little nests of macaroons... so gorgeous and delicious! 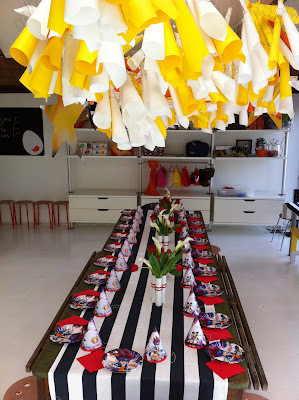 I just LOVED this party. Love love loved -- makes me wish a had a little girl! 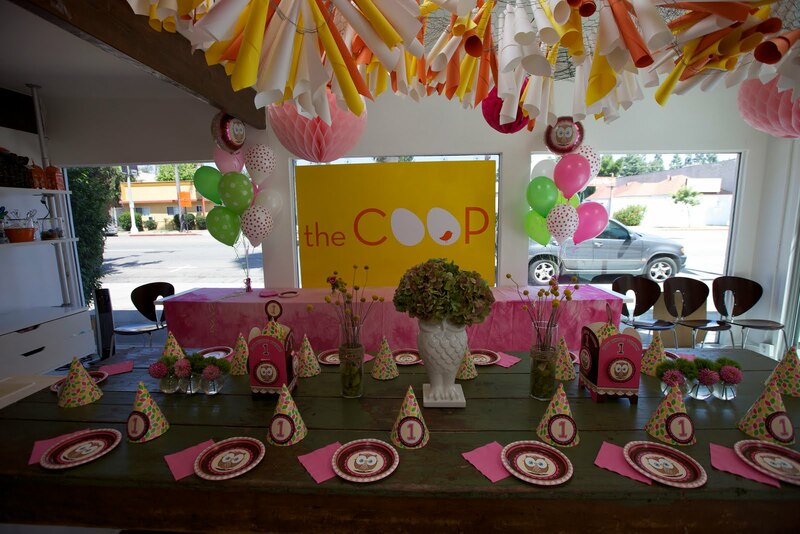 But I guess that's why I have the COOP -- so I can pink overload on other peoples parties!!! 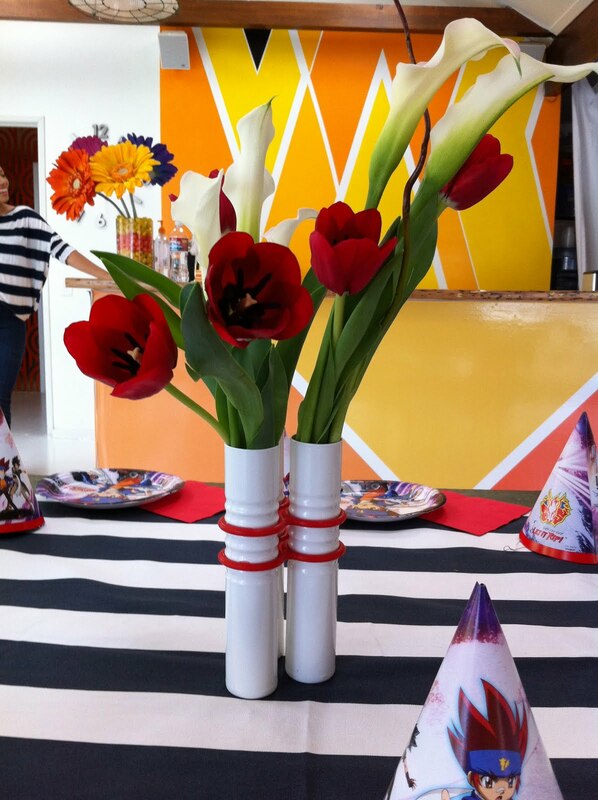 I had a woman in the other day who was a party planner... she was going through our party book and was quite impressed with our flowers. She kept pointing out pictures in the book "Did you do this arrangement?" "Yes. ", "How bout this one?" "yep", "Do you guys do all these flowers yourselves" "We sure do!" 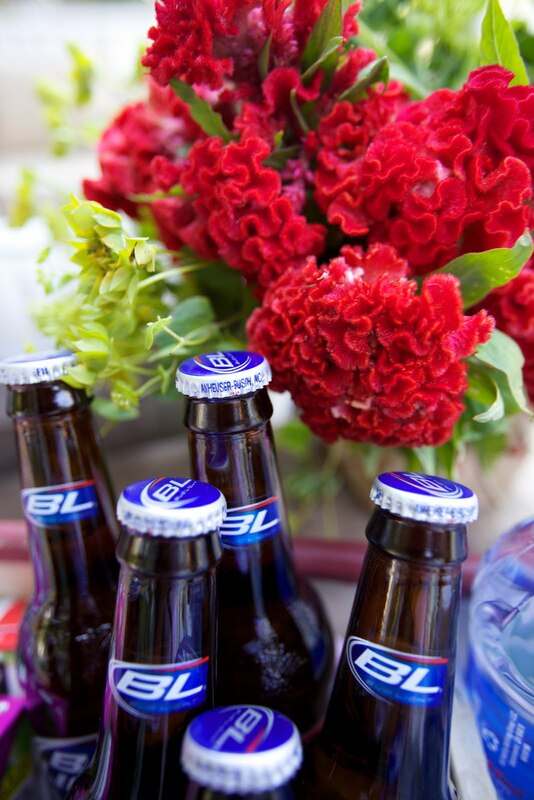 On top of all the actual party planning we do -- we spend a great deal of time at the Flower Mart! To be quite honest -- I really love it. 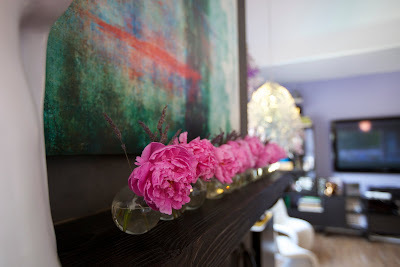 I LOVE getting down there super early in the morning and loading up on fresh beautiful flowers for the COOP -- for my house -- for a party -- for whatever. I just love flowers. 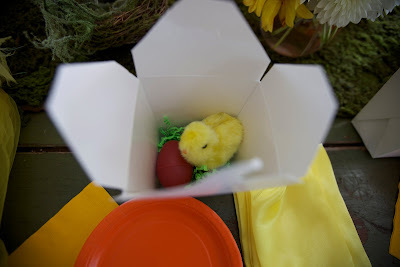 My mom was big into them -- she was ALWAY more concerned with how her parties LOOKED than what people ate (I have totally inherited that trait from her!). So anyway -- this woman was asking if I would do flowers for her events. OF COURSE! We are always looking at ways to expand the biz -- and a little flower arranging or party decor for your at home events is absolutely something we would consider. The pics above are from a party I did at my house -- just to give you an idea of the kinds of things we can do for a more "sophisticated" crowd (read: not 5 year olds!!) And, of course and as always, we can ALWAYS add fresh beautiful flowers to your event at the COOP! Just let us know and we will customize something special for your party! Are you ready for a testosterone fest? 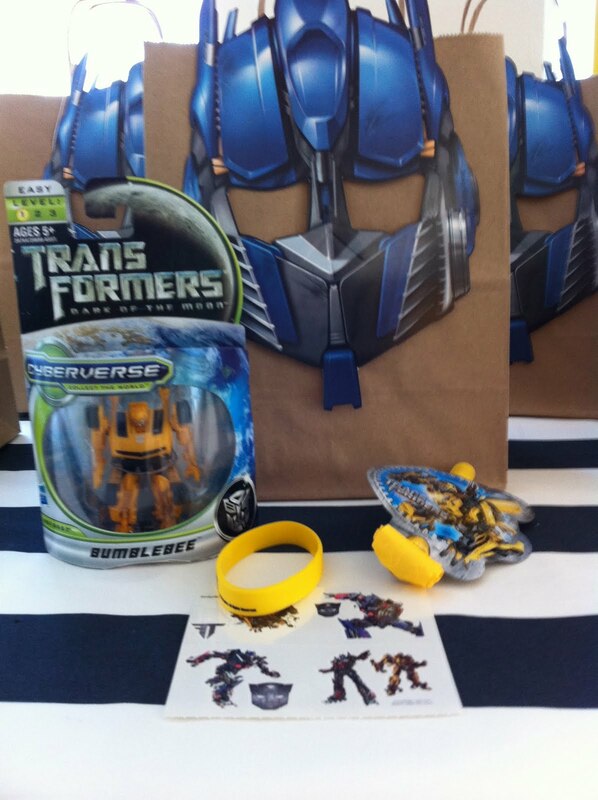 Well-- we've got a TRANSFORMERS party just for you! I was really happy with how this party turned out. The goody bags with the Transformers masks lining the back table really set the stage -- and the main table with the floral arrangements wrapped in Transformer masks made for a chic -- but still cool enough for a 5 year old boy -- look! 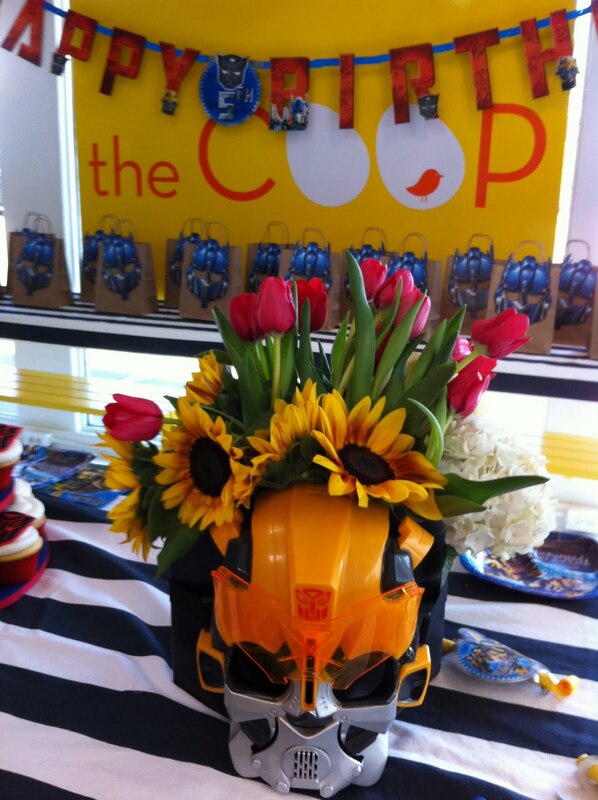 The cake was a great centerpiece ... and all the kids were more than thrilled with their take home treat -- a transformer mask, blowout, Tattoos, a rubber bracelet -- and an ACTUAL Transformer! Home run! 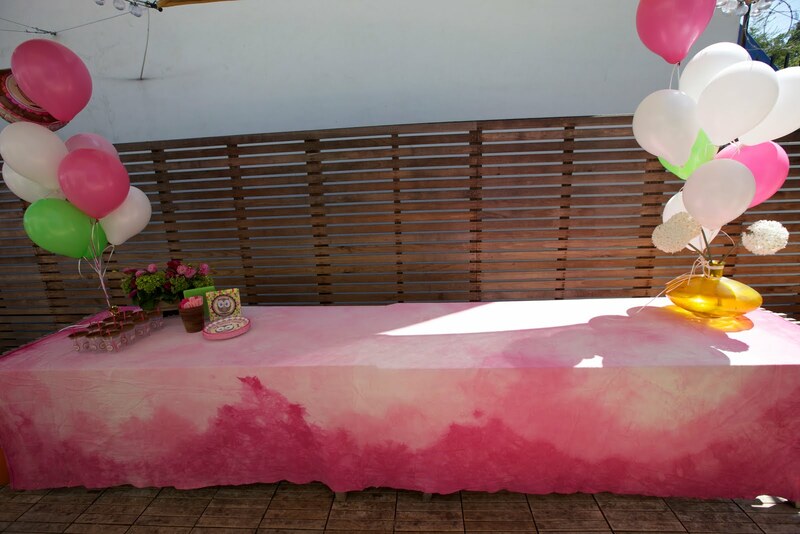 Like always -- we kept clear of plastic branded tablecloths -- and just used the branded plates, napkins and balloons (my oh my were those Transformer balloons BIG... they were the biggest Mylar balloons I have ever seen!) Super Fun, super fab... super COOP! Yeah COOP! The COOP turned THREE this week! Wow wow wow. 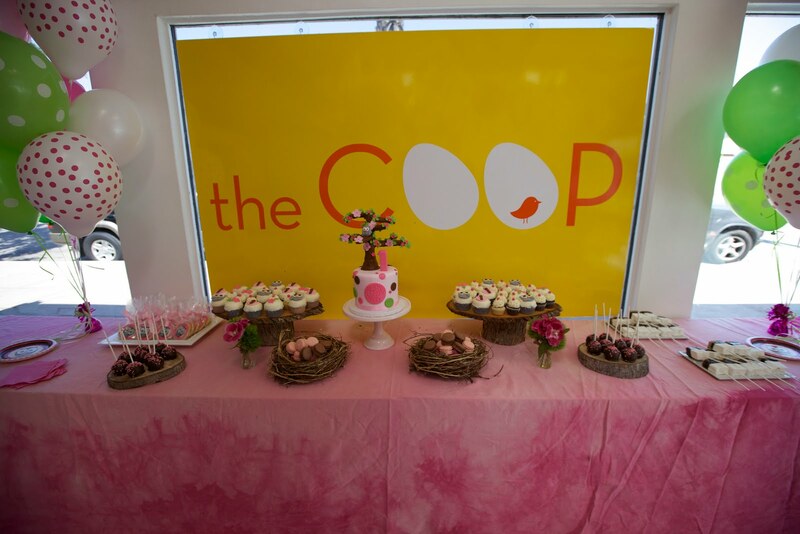 In one sense it seems like just yesterday that we started this great adventure -- in another it seems like we've never NOT had the COOP. When I think back over all the parties we have done.... we do at least 6-8 a weekend (sometimes more!!)... my oh my... that's a LOT of parties! It's pretty incredible. 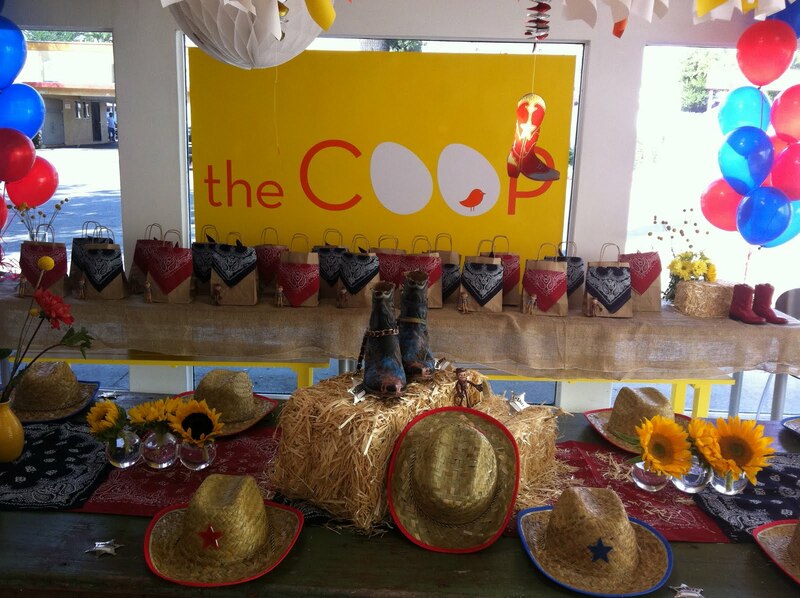 Lucinda and I are so proud of the work we have done with the COOP. Sometimes it's tough -- but mostly -- it's a pleasure. 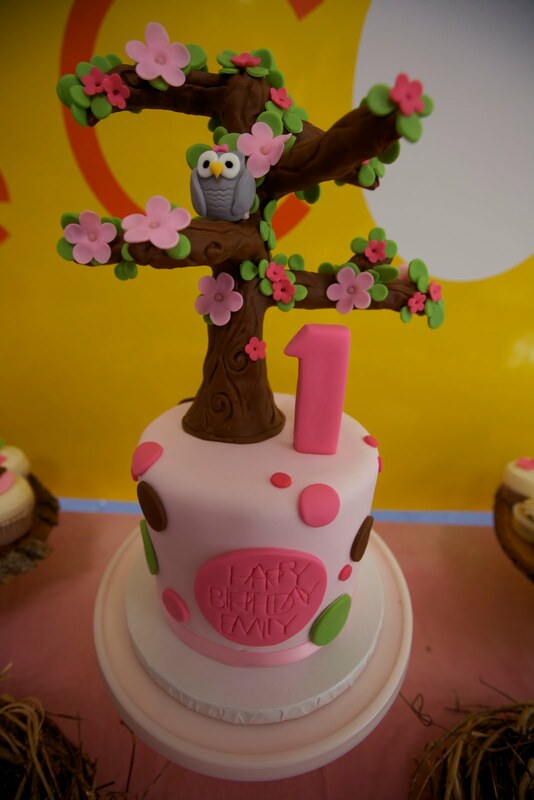 It's an amazing creative outlet for us and our many many many ideas... and dealing with people on such happy occasions is always a pleasure. We really intend to build this brand BIG, and the amazing feedback we have gotten over the years proves to us that we need to do just that! Here's to this next year expanding and growing this amazing space and concept to new levels! There are already a few copycats out there -- but we need to remind ourselves that while people may steal some of our concept or design sensibilities -- NO ONE can truly copy us! 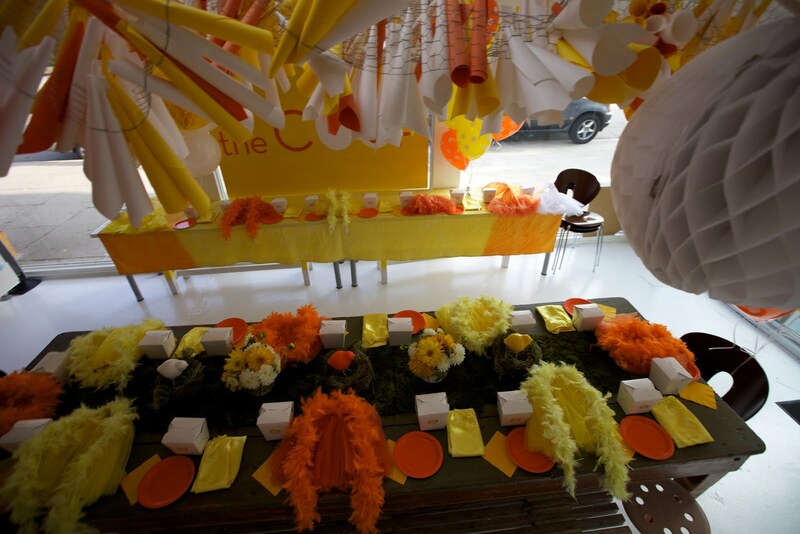 Our creativity and drive to make each and every party spectacular is what makes us special. 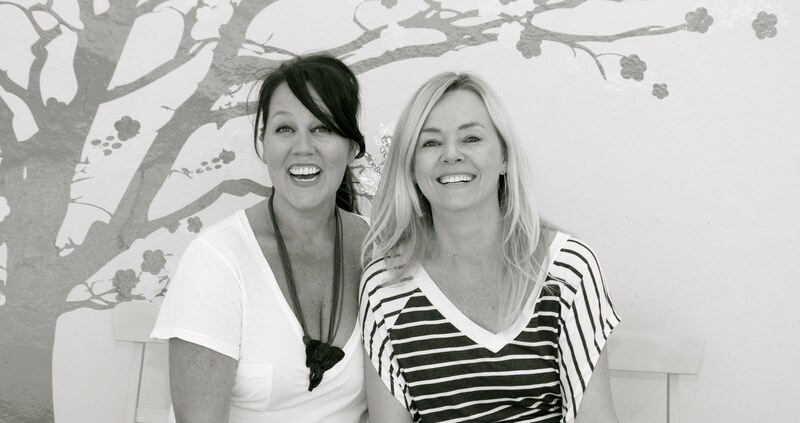 We are proud of all the work we do and really really look forward to all that lies ahead for us and our "baby". Viva la COOP! Oh my goodness! 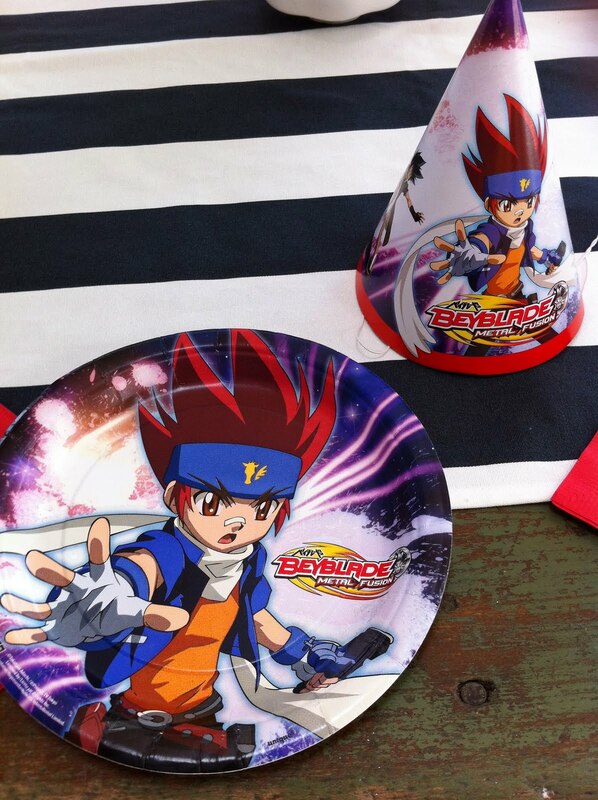 Beyblade! One of our repeat BDay party mommies called and said her son wanted a Beyblade party. Knowing that we don't do cheesy -- and that we would give it a COOP spin -- she left us to do our thing! We wanted to stay away form the branded goodies (we really gag at the teeny tiny cheesy plastic stuff that most party stores sell!) -- so we did our own interpretation on the theme. 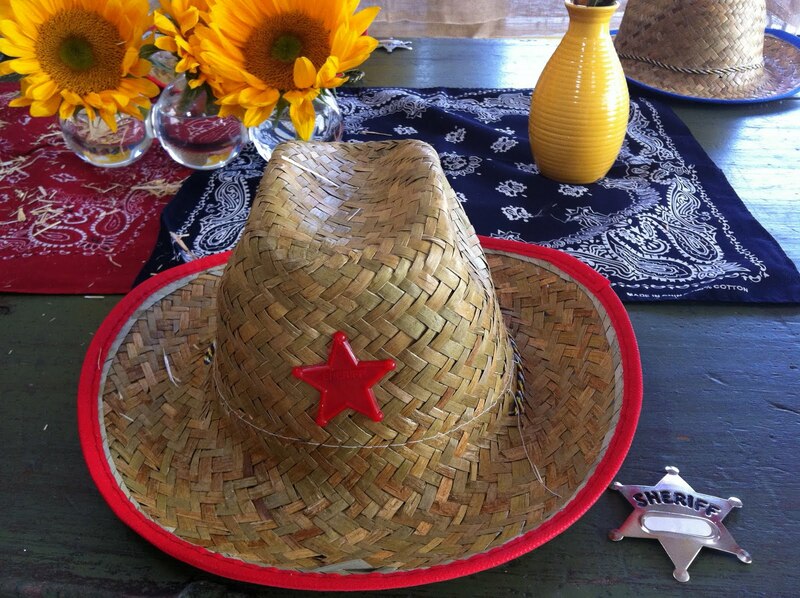 As we normally do with the branded parties -- we did have the branded plates, napkins, hats, and balloons --- but we don't do the plastic table covers. We used our blue and white material table runners, and did a combo of cool modern red and white flowers to add a little punch. 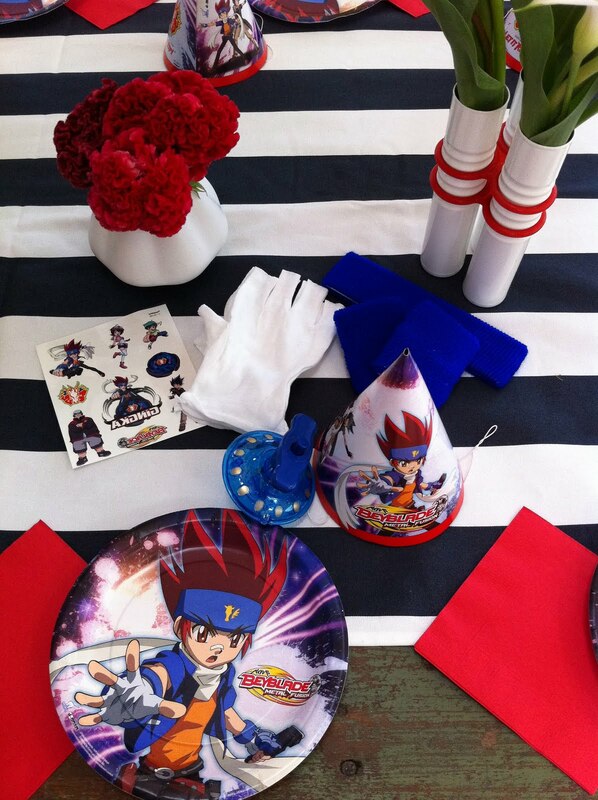 We COOP-ed up the gift with blue sweatbands and headbands and fingerless white gloves - just like the actual character wears - and did some tattoos (branded) and a super cool LED spinning top for everyone. The boys were so excited with their gifts -- they basically suited up in their gear and started an impromptu spinning top Beyblade battle right on the floor after cupcakes. I love when the kids are so happy with the gift! 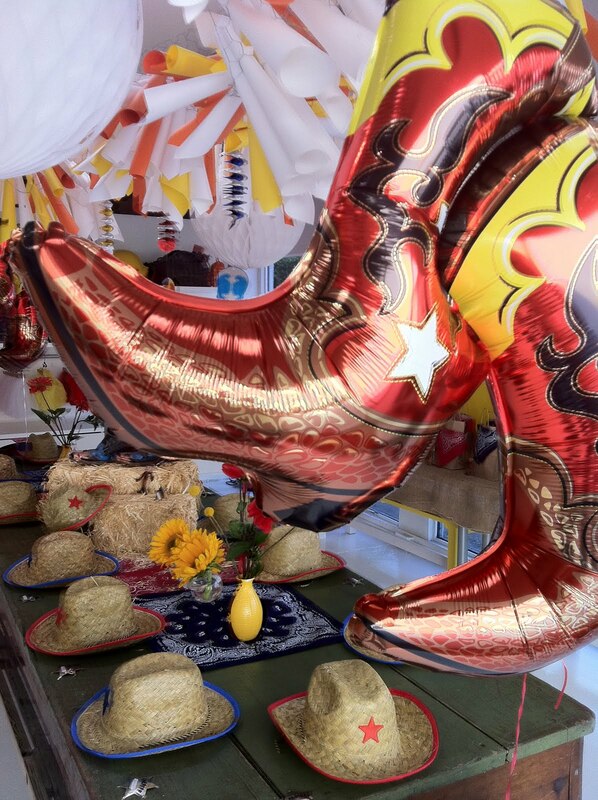 The gorgeous actress Marley Shelton chose a Cowboy Theme for her little cowgirl West's party and it was really fabulous. 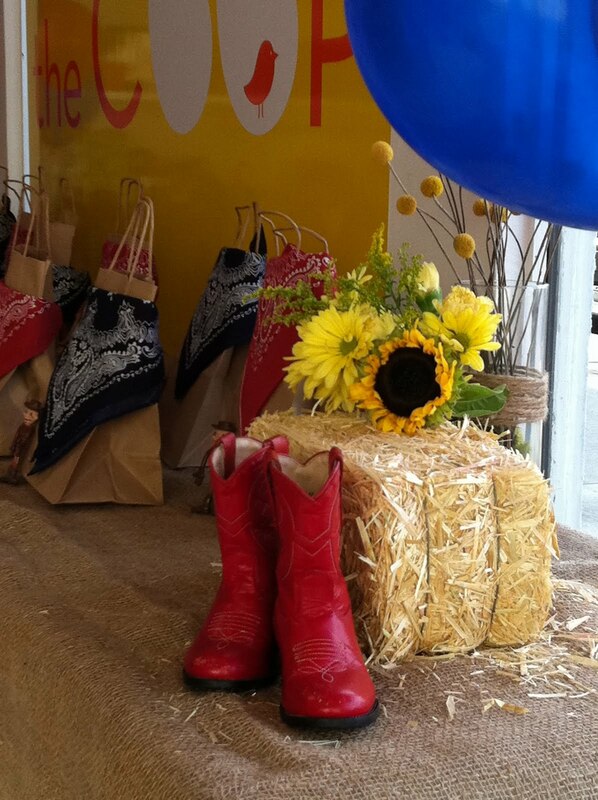 Marley really wanted the decor to have an emphasis on boots as West loves 'em, so when I saw the amazing boots Marley had, as well as West's. I had to use them in my decor. We had bandanna table runners and haystack center-pieces; all the little cowboys & cowgirls went home with a bandanna a cowboy hat a sheriff's badge and a bendy cowboy. We had classic country music - think Hank Williams & Patsy Cline - pumping through the COOP and it really did feel like the old West, which made the young West VERY happy.